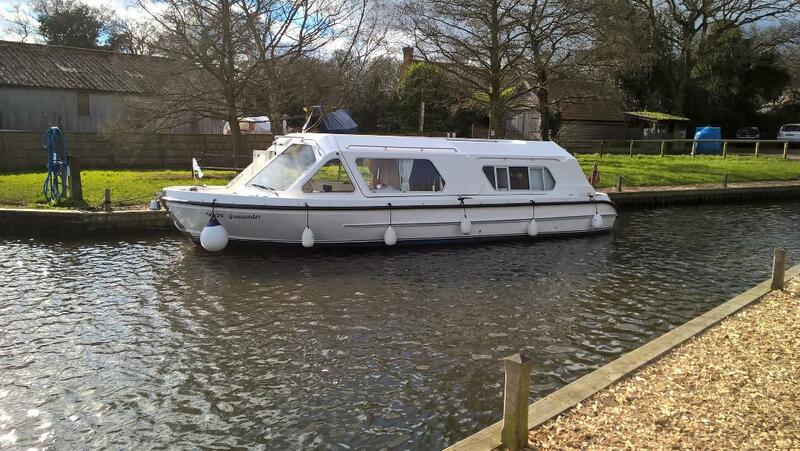 Add To Ignore List Share for sale in privately owned, self-managed Broads cruiser ‘Goosander’ based in Horning. One full share of 8% entitles the owner to 4 weeks holiday per year, one week in each season. Weeks are drawn at annual AGM so are variable and swaps may be possible. Goosander is a beautifully maintained vessel with 4 berths (one double cabin and pull-out berth in saloon), separate shower and toilet and a fully equipped kitchen. Current maintenance charge per annum is £880 so just £220 for a week of boating! Safety Holds current BSS certificate – recovery boarding ladder newly fitted, life belt etc. Add To Ignore List You two not selling up now are you? Was hoping to meet up as soon as we get ourselves settled here. Add To Ignore List Only one of our shares at the moment Buffalo, we currently have 2 and will be looking to buy our own eventually. We are back on 15th December, maybe we could meet up then if you are about. We moor close by 'Goosander' and know it to be a well cared for / well maintained boat. For anyone seeking a share in a syndicate boat this is definitely worth considering ( and no, we're not on commission ! ). Good luck with selling the share, Chelleandpaul. year but will make a note in my calender! Add To Ignore List Thanks very much Steve and Maggie for your lovely comment. It would be great to catch up Buffalo if you are around.